Roomy interior; sporty appearance; powerful and economical engines; safety. Following a complete redesign in 2008, the 2009 Honda Accord returns with only revisions to its horsepower and torque ratings for the 3.5L V6. 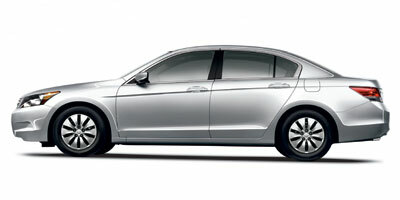 For automatic-equipped Accords, horsepower is revised from 268 to 271, with torque revised from 248 ft-lb to 254 ft-lb. Accords with manual transmissions receive the same horsepower revision, while torque changes from 248 ft-lb to 251 ft-lb. Honda's Accord got a completely new, more sophisticated and detail-oriented look in 2008, along with a complete mechanical redesign. The result is a car that stands out in the automotive world. Seats and seating are a particular strong suit of the new Accord. In front, they are generously apportioned, and Honda claims an equal level of comfort for both front and rear passengers. Overall interior volume is 120 cubic feet, which officially crosses the Accord over into large sedan territory. Despite being larger, the Accord has great torsional rigidity, which gives the car's suspension optimal ride and handling, with double wishbones in front and a multi-link setup in back, along with wide tires across the model line. Wheels range from 16-inch steel wheels on base models up to 17-inch alloys on up-level coupes and sedans; on the coupe, 18-inch alloys are also available. The Accord is offered in either LX or EX trim, with either a 2.4L 4-cylinder engine, making either 177 horsepower or 190 horsepower, depending on the model, or a 3.5L V6 making 271 horsepower. The V6 comes with the latest version of Honda's variable cylinder management (VCM) system, which can shut down two or three cylinders when possible to increase fuel efficiency. The more powerful 190-horsepower version of the four-cylinder engine uses a variable-valve silencer and high-flow exhaust system to bring improved performance with no penalty in fuel efficiency. This version is standard on base LX and upscale EX coupes, and also on mid-level EX sedans. A five-speed manual transmission is standard on all 4-cylinder engines, while a 5-speed automatic is optional with the four and standard with the V6. A 6-speed manual transmission is exclusively offered on the EX-L coupe. The Accord LX is an economical model that doesn't lack for creature comforts, while EX models are dressed up with alloy wheels, a chrome exhaust tip and blue ambient interior lighting, and include more luxury items such as heated mirrors, a moonroof and a security system. At the top of the range is the EX-L, which adds leather seating and trim, upgraded instrumentation, dual-zone climate control, and the premium audio system with active noise cancellation. Accord sound systems have MP3 and WMA compatibility and an auxiliary input jack. The base system has 160 watts, a CD player and 6 speakers; all now have RDS program information. Middle-trim models add a 6-disc CD changer, while top models bring the premium audio system, with 270 watts, seven speakers, an 8-inch subwoofer, and available XM satellite radio. There's also a navigation system that includes a Bluetooth hands-free phone link, voice activation, and an integrated Zagat guide. The list of standard safety equipment includes vehicle stability assist and active front head restraints, along with front side airbags, full-length side curtain airbags and 4-wheel anti-lock disc brakes with brake assist. The 2009 Honda Accord's engines stand out in the midsize sedan class as being both economical yet powerful, and its roomy interior also ranks as one of the most stylish. Standard equipment abounds in the Accord, and electronic stability control, which is commonly optional in this class, is installed across the line.